After the death of Kubrick not so long ago (the day he died was the first day in my life that I really felt old), and of Edward Yang very recently (not to mention Sven Nykvist, Bergman's close cinematographic compatriot, almost a year ago), the world has lost another inimitably great cinematic artist. Persona, Bergman's 1966 masterpiece, has a rightful canonical place (not yet fully granted, from what I can tell) alongside the ubiquitously and near-unanimously praised likes of La Règle du jeu, Citizen Kane, Vertigo, Breathless, 2001: A Space Odyssey, the first two Godfathers, and Taxi Driver as towering masterpieces of the medium--films no-one can call themselves a true cinéphile without having at least once given their undivided attention to. In my opinion, Winter Light, The Silence, Cries and Whispers, and Face to Face are also indispensable achievements. I composed the preceding bit of this post yesterday, but was unable to "publish" it until today. 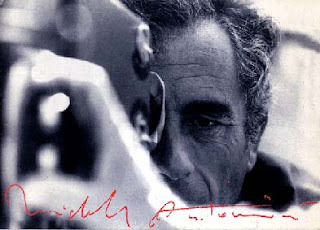 In the meanwhile, when I made my daily visit to IMDB, I discovered that yet another extremely important cinematic figure has gone: Michaelangelo Antonioni died today. 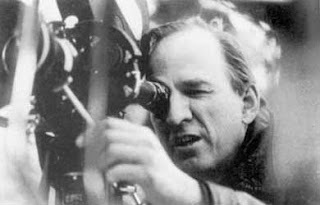 His L'avventura was, in its somewhat less immediately apparent way, just as radical a marker of new heights, new artistic capabilities for the medium as Bergman's great masterpiece referenced above. The 2005 re-release of his marvelous 1975 English-language film, The Passenger (which I eagerly carved the time out of an insanely packed schedule in order to see) found me at a time when the "Antonioni touch"--a sort of existentialist transvaluation of human significance that is seen readily in his very recognizable and unique mis-en-scène--was very helpful, literally edifying to me on a very personal level. His œuvre was much more erratic than that of someone like Bergman; but he has a significant share of indelible contributions. To my mind, foremost among those are the trilogy encompassing L'avventura, La Notte, and L'eclisse, as well as Red Desert, Blow-Up and The Passenger.